BAAGZ launched this past week at the DEMOfall 2007 conference to offer a social take on the personalized home page or startpage built on search. Built on the idea that a "baag" is a collection of sites, feeds, notes, videos and photos, Baagz enables users to organize and share their favorite stuff. Baagz has a very customizable interface that reminds me of a cross between yourminis with less widget options and Only2Clicks among others. Baagz is a product of Exalead a search company with expertise in indexing the Semantic Web so it only makes sense that Baagz allows users to share a "baag" to be indexed for search. 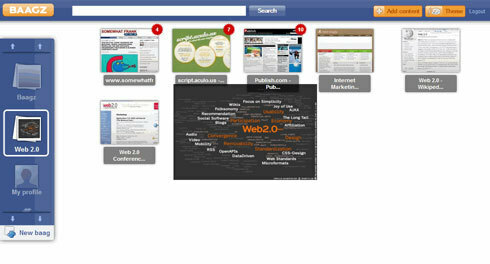 This means that users can find social recommendations via "baagz" created by other users. "BAAGZ uses its semantic description of every Web site stored in a baag to determine what a given baag is about – whether or not a given Web site is specifically tagged by baagerz. The system then uses this knowledge about every baager to connect him or her to other baagerz with shared interests." Other startpage products offer public pages so this is nothing new however it is interesting that BAAGZ appears to be focusing on leveraging these pages to provide social recommendations and a better search.